Support a great community that supports our country. DDS officially represents the Armed Forces, Veterans and Forces Community. Your company is listed on both the website and app. If you have a physical store you are plotted on our mapping system. Also Supporting the Emergency Services and NHS? Can you support the Emergency Services and NHS too? 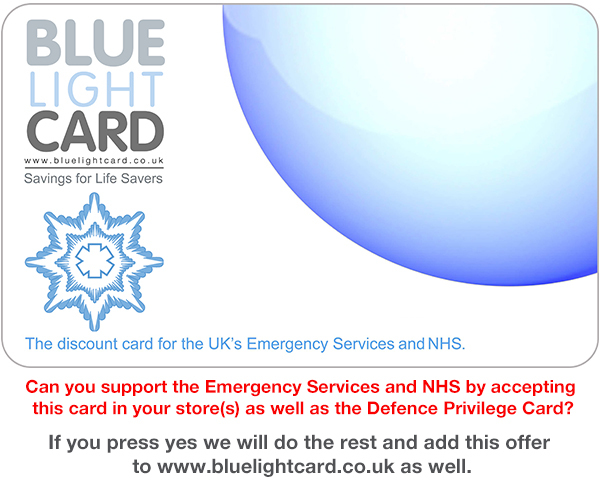 To save you time, we can add this offer to www.bluelightcard.co.uk free of charge for you. It is free to offer a discount to the Defence Discount Service Community. If you are an online retailer please complete the form below, once complete you will be then able to login to add an offer to the website and mobile application.